Stoddart Pub. Hardcover. 0773729712 New Condition. . New. Toronto: Stoddart, 1996. (cad) SIGNED BY AUTHOR, and dated 1997, no other markings, about Fine in about Very Good dust jacket with a large crease to the front panel. Boards, map endpapers, 224pp. Colour photographs and augmented with historic B&W photos to give a hisory of the Great lakes. A heavy book. (3.9 JM FO 53/2. Signed by Author. 1st. Hardcover. Near Fine/Good. Illus. by Gallant, Andre. 4to - over 9¾" - 12". Stoddart Pub. Hardcover. 0773729712 Like New Condition. . Fine. U.S.A.: Stoddart, 1996. pp.223 Photos. by Andre Gallant. 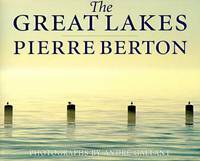 Awe and terror are only two of the themes in Berton's narrative. clean tight copy some rubbing to top and botton spine boards and slight corner wear. . First. Hard Cover. Near Fine/Fine. 4to - over 9¾" - 12" tall. Toronto, Canada: Stoddart Publishing Co.. VG/VG. (1996). ........ Cloth w/DJ. 4to., 223pp., Label pasted to front e/p . Stoddart. Used - Good. Former Library book. Shows some signs of wear, and may have some markings on the inside. Stoddart Publishing, 1996. Hardcover. Good. Disclaimer:A copy that has been read, but remains in clean condition. All pages are intact, and the cover is intact. The spine may show signs of wear. Pages can include limited notes and highlighting, and the copy can include previous owner inscriptions. At ThriftBooks, our motto is: Read More, Spend Less.Dust jacket quality is not guaranteed. Stoddart Pub. Hardcover. VERY GOOD. Light rubbing wear to cover, spine and page edges. Very minimal writing or notations in margins not affecting the text. Possible clean ex-library copy, with their stickers and or stamp(s).